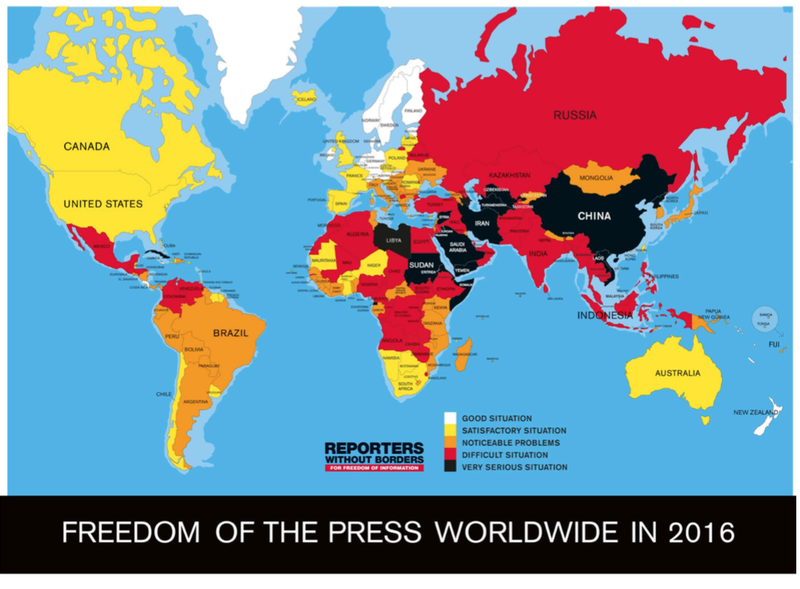 Reporters Without Borders (RSF) released its annual World Press Freedom Index for 2016 which ranks 180 nations according to the level of freedom available to journalists, a ranking that RSF has published annually since 2002. The ranking is based on a questionnaire that is supplied to key people within each nation as you will see below. Scores provide a snapshot of the freedom of the media in each nation based on several categories that are critical to ensure that the press remains free of outside interference or influence. It is important to note that RSF does not rank the quality of journalism, a rather fortunate turn of events for many newspapers, radio stations and television stations in many nations. 1.) Pluralism - measures the degree to which opinions are represented in the media. 2.) Media Independence - measures the degree to which the media are able to function independently of sources of governmental, business, religious and political influence. 3.) Environment and Self-Censorship - analyzes the environment which news providers operate. 4.) Legislative Framework - measures the impact of legislation that covers news and information activities. 5.) Transparency - measures the transparency of the institutions and procedures that affect news and information production. 6.) Infrastructure - measures the quality of the infrastructure that affects news and information production. 7.) Abuses - measures the level of abuses and violence against the news and information industry. Scores range from 0 to 100 with 0 being the best score and 100 being the worst. RSF calculates two scores; ScoA is based on the first six of the seven indicators listed above and ScoB combines the first six indicators with the seventh (abuses). A nation's final score is the greater of these two scores. 1.) From 0 to 15 points is considered good (light yellow). 2.) From 15.01 points to 25 points is fairly good (dark yellow). 3.) From 25.01 to 35 points is problematic (orange). 4.) From 35.01 to 55 points is bad (red). 5.) From 55.01 to 100 points is very bad (black). If you are interested, here is a link to the questionnaire. And, for your information, the last place finisher was Eritrea with a score of 83.92. While a lack of press freedom in nations like Russia and China is not terribly surprising, it is interesting to see that the United States and United Kingdom have scores that suggest that the press is not as free as one might expect. In the case of the United States, while media freedom is enshrined in the First Amendment to the Constitution, the government's attacks on whistleblowers are quite apparent (just ask Edward Snowden). As well, American journalists are not protected by laws that guarantee that they don't have to reveal their sources. In addition, the unspoken threat that journalists will lose access to "breaking news" from government sources if they don't "play nice" also has a bearing on how and what news is reported. While not terribly surprising, it is also interesting to see how American allies in the Middle East, including Israel and Saudi Arabia, both score very poorly as do the recipients of American-led military actions including Afghanistan and Iraq. So much for instilling American-style democracy. Where freedom of the press is illusory, what passes for journalism is really not newsworthy. As we've noted during the latest election cycle in the United States, reportage has been biased to a level that has made it almost valueless to voters who actually want to know where a candidate stands on key issues. This illusion of press freedom creates a voting public that is ignorant of what really matters, instead, creating a highly biased electorate. How much is RSF itself an illusion? Robert Menard, the Secretary General of RSF, was forced to confess that RSF's budget was primarily provided by "US organizations strictly linked with US foreign policy" (Thibodeau, La Presse). Media ranked highly by RSF has no credibility with its readership – as in the USA, where Gallup found its credibility below 20%. Media ranked low by RSF has high credibility with its readership – as in China, where it's 80%.